A special patient’s poem just two weeks after her fifth hip surgery. Thank you for the spectacular care, brilliant medical service and remarkable bedside manner. Every day I am so grateful for your brilliant diagnosis and surgical expertise. William A. Leone, MD, FACS is one of the nation’s top orthopedic surgeons with more than 28 years of experience at Holy Cross Hospital. A recognized expert in his field, he has operated on thousands of people with hip and knee conditions from all over the world. He prides himself on solving complex hip and knee problems and is gratified by the profound positive effect that his interventions have had on the lives of his patients. 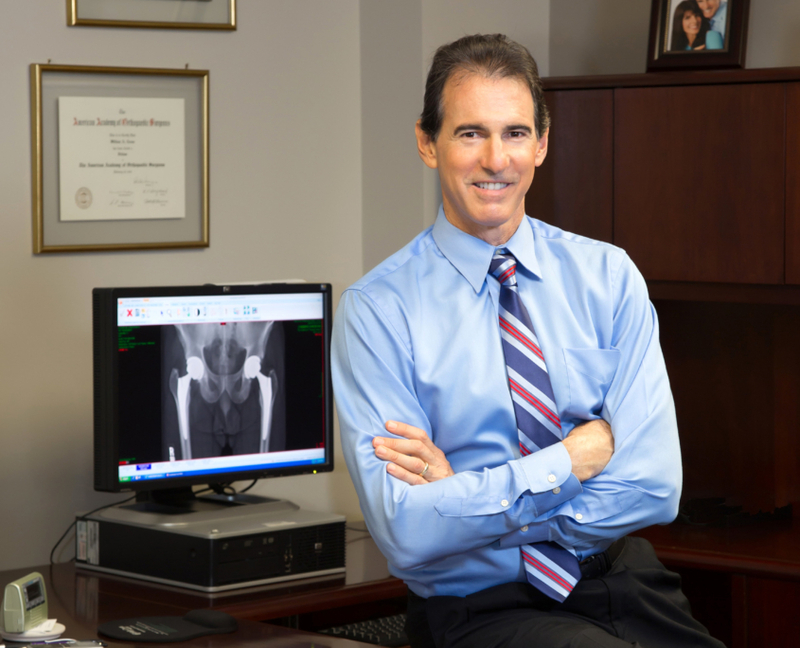 Dr. Leone founded the Leone Center in 2009 in order to provide state-of-the-art orthopedic care, using proven techniques and technologies in a compassionate, patient-focused way. He uses a range of technologies in his practice, including computer navigation, kinematic sensors and robotics for partial and total knee replacements, and his own invention, the Pelvic Alignment Level (PAL), for implant positioning, balancing and leg length reconstruction during total hip replacements. His meticulous, precise and gentle soft-tissue handling during surgery results in less tissue trauma, bleeding and postoperative pain. This approach consistently produces faster healing and better outcomes. A sought-after industry consultant for implant, instrument design and clinical application for the orthopedic industry, Dr. Leone has been involved in clinical trials and reviews of new orthopedic techniques and equipment. He has taken an active role as chairperson and faculty at symposiums that provide continuing medical education for hip and knee surgeons in the United States, Europe, Latin America and the Caribbean. In addition to lectures, he mentors orthopedic surgeons as well joint replacement fellows and medical and pre-medical students in patient care and surgical techniques. Inventor of the Pelvic Alignment Level (PAL), a device and technique that assists surgeons during Total Hip Replacement (THR) to achieve more precise implant positioning and leg length, to optimize hip mechanics and to maximize longevity of the prosthetic joint. The Effect of Preoperative Planning and Impaction Grafting Surgical Technique on Intraoperative and Postoperative Complication Rate for Femoral Revision Patients with Moderate to Severe Bone Loss: Mean 4.7-Year Results, The Journal of Arthroplasty, November 26, 2007. Technique on Intraoperative and Postoperative Complication Rate for Femoral Revision Patients with Moderate to Severe Bone Loss: Mean 4.7-Year Results, The Journal of Arthroplasty November 26, 2007.